Real Hope in Kenya’s Kawangware Slum. Mary Lives in Kawangware Slum with her family. Many of her siblings are already living on the streets. 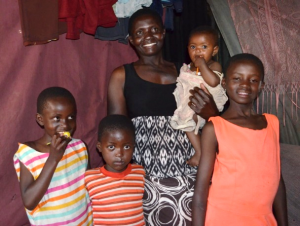 Mary has seven siblings and has grown up cared for by a single mum. They live in Kawangware in a 100 square ft home made of aluminium sheeting. The living conditions in Mary’s home are very difficult. Her family struggle to have enough food or water. They don’t have a toilet or electricity and they sleep in a single room. Most of Mary’s older siblings are already living on the streets. Through the drop-in centre, a sponsor was found for Mary and the team worked with her family to identify their needs and support them. Mary’s mother works hard for local people cleaning and cooking, but with a low income, she struggles to provide for the needs of the family. 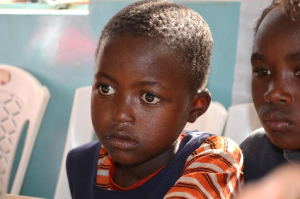 School is something that has not been possible for Mary or her siblings. Through the community work of RHYCO, the team were able to meet with Mary’s family and identify their greatest needs and support them. The RHYCO team were also able to find a sponsor for Mary so she is now able to go to school where she receives a quality education and nutritious meals. Mary’s teachers are impressed by her quick progress at school. Through education, Mary will be better equipped to provide for herself and her family in the future. We want to continue to support families like Mary’s. In 2018 and 2019 we hope to expand this work to reach more children and their families struggling with life in poverty and on the streets. Read on to find out more. Real Hope Youth Community Organisation. In 2017, we joined International Needs Kenya and Canada to support the Real Hope Youth Community Organisation (RHYCO) project in Kawangware slum, in Nairobi, Kenya. RHYCO have been operating since 2014 and are part of International Needs Kenya’s work. RHYCO run a drop-in centre for children living on the streets of the Kawangware slum. The centre currently operates three days a week providing counselling, therapy, literacy and education for street children between the ages of 5 and 10. In 2018/19 we want to support the growth of this work so that it can run five days a week and to hire an Early Childhood Development teacher to increase the centre’s capacity to provide quality education for the children attending. We also want to support IN Kenya in finding sponsors for the many children identified through this project. Sponsorship will enable these children to start full time education in local schools. We want to find sponsors for 20 of these children by the end of 2018. Could you sponsor a child in Kawangware to go to school? Find out more about sponsorship and sign up here.